This whole post can really be summed up in four words: I. Love. This. Recipe. I haven’t been able to stop raving about Dorie Greenspan’s Pumpkin-Gorgonzola Flan all week because it’s that good. I’m sure many French Friday with Dorie followers will also agree. Everything about this dish is beautiful: the visual aesthetic, the flavor combination, the simplicity of the recipe and the taste. The moment you pop these out of the oven, you’re instantly greeted with gorgeous little cups of happiness. 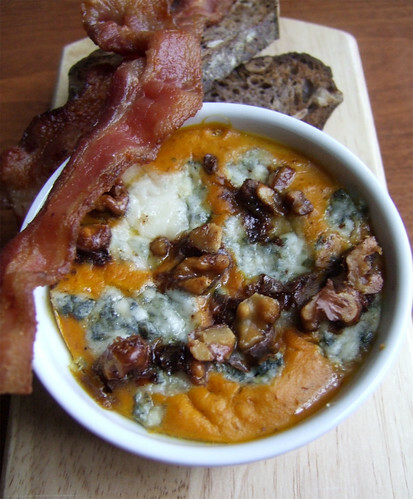 Bright pumpkin-orange speckled with white and grayish-blue from the gorgonzola and toasty brown from the walnuts. Then the smell hits you: pungent, savoury blue cheese, spicy nuts, sweet pumpkin. You know what you’re about to spoon into your mouth will taste divine. From the name and the picture in Around My French Table, it may seem like a really fancy and complicated dish, but this flan literally comes together in minutes. 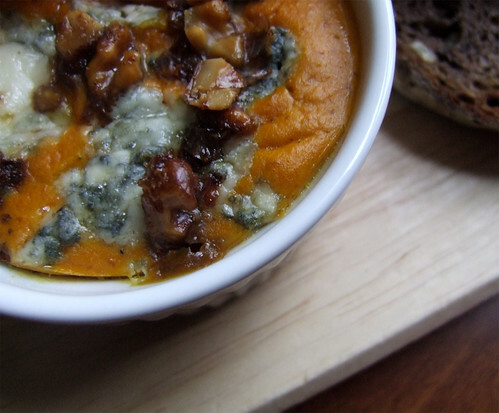 Dorie helps save you a lot of time by using canned pumpkin purée in the recipe. However, if you want to go all out and really make an impact, you can always cook and purée your own pumpkin for the recipe. Rich and creamy, this is reminiscent of a savoury cheesecake and is one of the easiest custards you’ll ever make that’ll impress all your dinner guests and have them thinking you are a hostess extraordinaire! 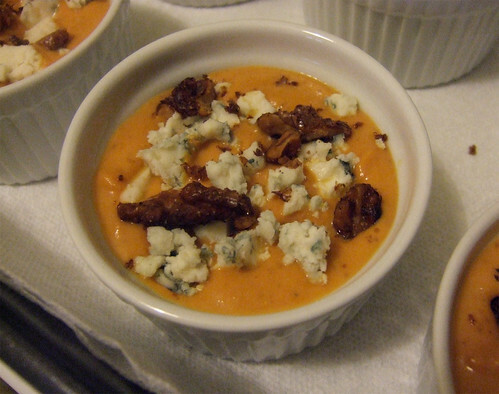 In my version, I sprinkled a bit of gorgonzola at the bottom of each ramekin before pouring in the pumpkin mixture, just to have a little something extra special when I dipped my spoon into the custard. I also grated in some fresh nutmeg to the pumpkin mixture and made a batch of spiced walnuts to sprinkle on top. Pecans would also be a lovely alternative. The pumpkin-gorgonzola flan makes for a wonderful starter to an elegant dinner, or as a stand-alone for a fall lunch. I loved serving the flan alongside some toasted slices of walnut sourdough—the flan doubles for a perfect creamy spread. This is a must-try! You too can cook along with Dorie and fellow Dorie fans every Friday. Just pick up your copy of Around My French Cooking, sign up with French Fridays with Dorie, and start cooking! Posted by Bonita at 7:00 a.m.
Mardi @eatlivetravelwrite November 19, 2010 at 8:17 a.m. Anonymous November 19, 2010 at 1:36 p.m.
Kris' Kitchen November 20, 2010 at 12:00 a.m.
Beautiful photos and so glad you liked it. I just sprinkled the cheese and nuts on the top of my flans and added a little sour cream...however, I wish I had spiced them up a bit, added a sweetener, and like you, put cheese or something through the flan to the bottom. Mine were a little flat tasting...needed some of those great ingredients all through the dish. Great job and thanks for the tips. Allison November 20, 2010 at 1:35 a.m. I love how you describe the flans! Absolutely divine! I can't wait to try them this week! Beth November 20, 2010 at 12:18 p.m. Anonymous November 27, 2010 at 12:10 a.m.
ok, after reading your post I think I'll try this one again. i was so excited to make this dish but it fell flat. I thought the pumpkin was a bit bland, but I like your idea of putting cheese at the bottom (maybe with some bacon too?). Eyelady March 4, 2011 at 11:10 p.m. These flans were awful. Smelled like old socks and were not visually appetizing. A real disappointment.